I grew up going to the Rock County 4H Fair each summer. As a child I wanted to eat cheese curds and eclairs. I wanted to watch the ducklings go down the slide into the water. I wanted to ride the Tilt-A-Whirl and the Scrambler. As a pre-teen, I wanted the "Moonlight Madness" wristband to go on the rides endlessly with my friends. The fair was where I saw Tiffany in concert. The Wisconsin State Fair sets the bar really high for state fairs. I remember going to the Indiana State Fair as an adult and being saddened by the fact that it was a dry event and there was not an adult beverage to be had. The Colorado State Fair is two hours away in Pueblo. 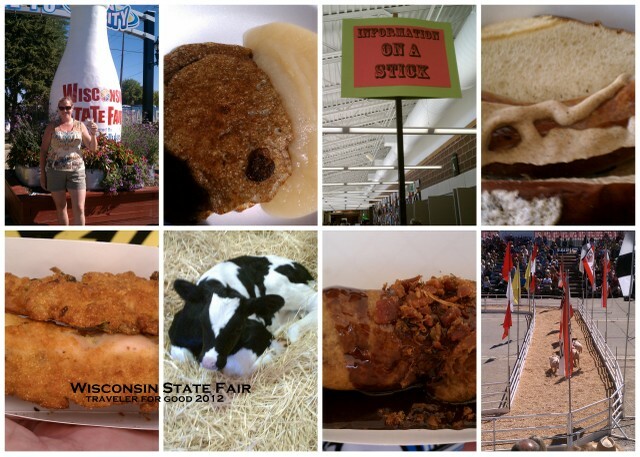 I realize my state fair experience is limited to these three, so I'm going to claim that of state fairs that I have visited, Wisconsin's is the best. Food on a stick is the theme at all fairs these days. Can I put it on a stick? If the answers are all yes, you have a new fun fair food. Some of the items we tried at the Wisconsin State Fair included: root beer flavored milk (it is Wisconsin after all), crab cakes on a stick, fried stuffing balls on a stick, pot stickers on a stick, potato pancakes - NOT on a stick, fried cheese curds, beer floats, Leinenkugel's Summer Shandy and Berry Weiss, fried bacon, the Fat Elvis (deep fried peanut butter cup in a banana coating with bacon on top) and a pulled pork sandwich inside a Bismark. I LOVE that you saw Tiffany in concert! Where does Cheyenne Frontier Days rank? Perhaps one day I can take you to the infamous Beer Garden in NWI - we love our town fairs.